In Ciudad Juarez, a territorial power normalized barbarism. This anomalous ecology mutated into a femicide machine: an apparatus that didn’t just create the conditions for the murders of dozens of women and little girls, but developed the institutions that guarantee impunity for those crimes and even legalize them. A lawless city sponsored by a State in crisis. The facts speak for themselves. Best known to American readers for his cameo appearances as The Journalist in Roberto Bolano’s 2666and as a literary detective in Javier Marías’s novel Dark Back of Time, Sergio González Rodríguez is one of Mexico’s most important contemporary writers. He is the author of Bones in the Desert, the most definitive work on the murders of women and girls in Juárez, Mexico, as well as The Headless Man, a sharp meditation on the recurrent uses of symbolic violence; Infectious, a novel; and Original Evil, a long essay. 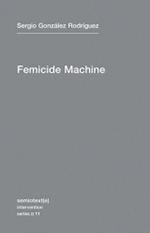 The Femicide Machine is the first book by González Rodríguez to appear in English translation. Written especially for Semiotext(e) Intervention series, The Femicide Machine synthesizes González Rodríguez’s documentation of the Juárez crimes, his analysis of the unique urban conditions in which they take place, and a discussion of the terror techniques of narco-warfare that have spread to both sides of the border. The result is a gripping polemic. The Femicide Machine probes the anarchic confluence of global capital with corrupt national politics and displaced, transient labor, and introduces the work of one of Mexico’s most eminent writers to American readers.